It’s been said, especially in New Jersey track and field circles, that the hardest state championship to earn is the first one. Need proof? Look no further than the storied St. Dominic Academy track team, which has enjoyed a ton of success over the last four decades, but never won an NJSIAA state relay title before last year. A lot of that was because St. Dominic was situated among the NJSIAA Non-Public A classification schools, a lot more competitive group with bigger schools. But a few years ago, a dip in enrollment placed SDA among the Non-Public B schools, so it meant a better chance to compete on the state level. So when the Blue Devils headed to the Bennett Center in Toms River in January of 2018, there was a better chance of the team winning the NJSIAA Non-Public B state relay championship. Sure enough, the Blue Devils did win their first-ever state title that fateful day last January, so now there was a slight bit of pressure on the team to try to duplicate the feat again recently at the Bennett Center. 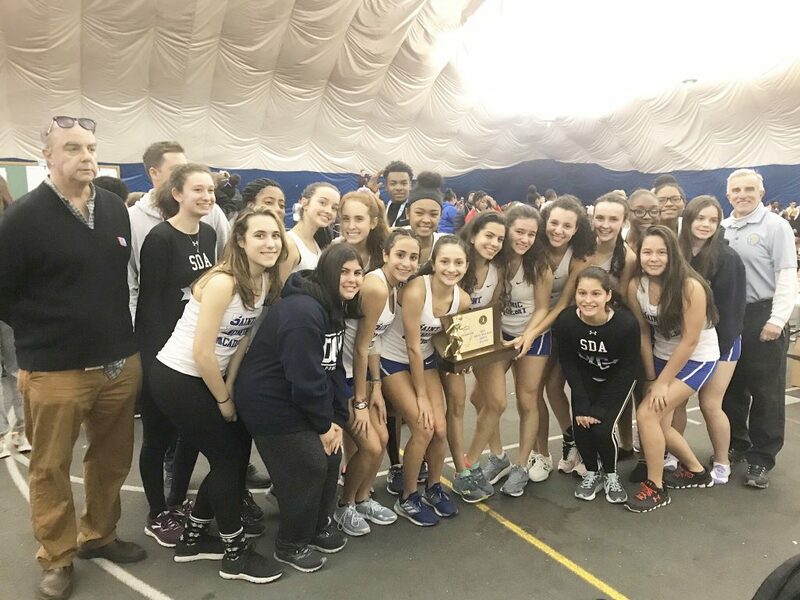 The Blue Devils did it exactly according to the way it was drawn up and they captured their second straight NJSIAA state relay championship. But in only one event, the high jump relay, did the Blue Devils win and collect the 10 team points that comes with a gold medal. The Blue Devils had to earn this state title by scoring eight points here and six points there. While the Blue Devils only won gold in the high jump relay (with Logan Hart and Suhayla Johnson doing the honors there), they did finish second in three events, third in two events and fourth in another. That’s good enough consistency to bring home the state championship. The Blue Devils were second in the 4×200-meter relay (Hart, Johnson, Isabel DeBari and Milani Bethel), second in the 4×400-meter relay (Kayla Sullivan, Andrea Tlacuilo, Megan Van Alsytne and Bethel) and second in the 4×800-meter relay (DeBari, Tlacuilo, Van Alstyne and Sullivan). They were also third in the distance medley relay (DeBari, Johnson, Sullivan and Van Alstyne), third in the sprint medley relay (Johnson, Madison Cortes, Bethel and Makenzie Kwiatkowski) and fourth in the shuttle hurdles relay (Bethel, Cortes, Hart and Caroline O’Donnell). That’s consistency in the truest sense. Bethel, a sophomore, had a fantastic meet. Even though she’s only a sophomore, it doesn’t hurt for Bethel to start thinking about the future. “I definitely see running in my future and I’d love to be a [NCAA] Division I athlete,” Bethel said. Johnson, a junior, was once one of Bethel’s fiercest foes, especially when the two would face off in grammar school events. But now, the two are teammates. DeBari is one of the few seniors on the SDA roster. Sullivan, also a sophomore, knows that teamwork is the key ingredient. And perhaps the best is yet to come for the Blue Devils. DeBari plans on majoring in health science, with her eye on nursing.